Measurement of atmospheric CO2 levels from space could provide regional and seasonal information on global atmospheric carbon dioxide levels. This information would aid in the quantification of surface fluxes of CO2 and their variation by providing consistent global measurements of atmospheric CO2. Forests are critically linked to the carbon cycle and provide 90% of the above-ground carbon storage capacity. Reliable estimates of their carbon storage capability obtained from measurements of forest canopy height can provide additional information on the sources and sinks of carbon dioxide in the biosphere. A multifunction space borne differential absorption LIDAR (DIAL) system could provide an excellent approach to making the required measurements of both atmospheric CO2 concentrations and forest biomass. A space-borne DIAL system can measure over the full diurnal cycle, together with coverage at high latitudes, where solar zenith angles are too large for reliable passive NIR measurements. Furthermore the small footprint of LIDAR systems offers the potential to use gaps in cloud cover to probe surface CO2 in cloudy regions, such as the Amazon basin.The University of Leicester has developed a model to assess the performance of a 2.05 μm differential absorption LIDAR (DIAL) system and to generate appropriate system performance specifications. The model incorporates the impact of laser pulse shape and duration, skewing, atmospheric absorption and scattering, sampling phenomena and detection noise. Both direct and heterodyne detection have been modelled and their performance compared. Results indicate that heterodyne detection has advantages where return signals involve small photon numbers. A separate model has also been developed to investigate the possibility of acquiring forest canopy height measurements (and hence forest biomass) using range measurements from the same 2.05 μm DIAL system. To extract useful information on forest biomass, LIDAR returns from the canopy and ground must be separable to reliably estimate tree height. The canopy cover can be derived from the fractional energy returned from ground and canopy. This can then be related to biomass and leaf area index. Unfortunately the requirements for DIAL and canopy LIDAR systems differ significantly. Ideally a canopy LIDAR would operate in the 0.85 μm to 1.1 μm wavelength range where vegetation reflectivity is high. Furthermore, an illuminating beam footprint around the size of a tree crown (20 m to 30 m) would be optimum in conjunction with a range resolution of < 50 cm. Conversely, 2.05 μm is preferred for CO2 column concentration measurements and here the vegetation reflectivity is low. To achieve the narrow linewidths required for DIAL measurements the transform limited laser output pulse duration will be 20-100 ns which will blur range returns and making traditional feature extraction impossible. To examine the feasibility of performing canopy height measurements with a laser source suited to measuring atmospheric CO2 concentrations a computer model which simulates canopy height measurements with a long-pulse 2.05 μm DIAL system has been developed. It is concluded that frequency doubling some of the 2.05 μm source laser pulse to provide a second waveband at 1.03 μm would allow structural measurements over steep topography in many cases.The atmospheric CO2 and canopy modelling work combined with the literature review has been used to provide an instrument specification for a DIAL system based upon QinetiQ’s hollow waveguide (HWG) technology. This is a hybrid integration technology in which HWGs formed in the surface of a dielectric substrate are used to guide light through a circuit of optical components which are themselves mounted within precision alignment slots formed in the surface of the substrate. QinetiQ’s hollow waveguide optical integration technology provides an integrated alignment solution which is impervious to optical misalignment, can be enclosed to prevent optical contamination and allows for dense packing of optical components thus reducing the mass and volume footprint of the system. 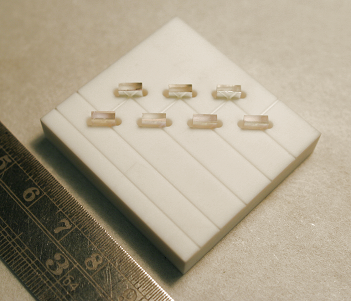 By physically constraining each component and guiding the light from one component to another, the resulting optical systems are more immune to misalignment making this technology highly suited to space applications.A 2.05 μm DIAL HWG breadboard has been designed, manufactured and assessed. Where the performance of the system has related to the optical alignment achieved within the hollow waveguide DIAL circuit itself, the measured performance of the demonstrator system has, in all cases, been excellent. Homodyne detection efficiency was ~90% of the theoretical maximum, the Doppler line-of-sight velocity from a rotating speckle target was successfully measured in a laboratory environment and the attenuation within the hollow waveguide circuits was close to theoretical level of 0.0005 cm-1. The optical assessment of the HWG DIAL demonstrator has highlighted the significant potential of the technology to enable the manufacture of compact, rugged, low mass, high performance optical systems for space instrumentation applications. Further information about the optical hollow waveguide technology is contained in this CEOI Case Study, available for download. The work is led by QinetiQ with University of Leicester and CTCD.